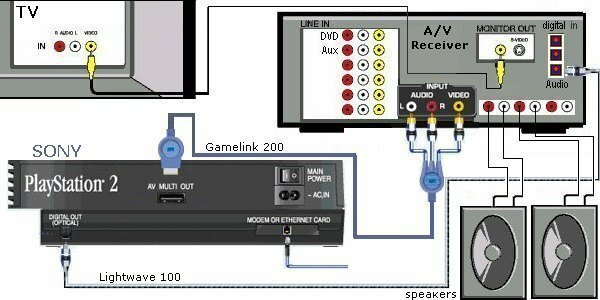 Connect a SONY Playstation 2 video game to an A/V Receiver and TV. o SONY Playstation 2 game system. You can use your loudspeakers instead of the tiny speakers in your TV. This enhances your game experience. SONY Playstation 2 can also play Audio CDs and DVDs. o Decode digital audio using A/V receiver. The TV will need to be set to Line 1 (L1) to receive the video output from the A/V receiver. The A/V receiver will need to be set to line for Playstation in order to get the Playstation output. The Gamelink cable has multiple pins for audio and video. 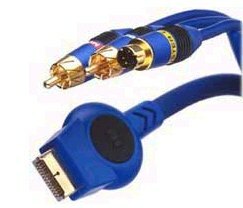 S-Video and component video Gamelink cables are also available. The TV is connected to the MONITOR output on the A/V receiver for video. * The term "DVD-Video" is used to refer to DVD-R, DVD-RW (Video mode), DVD+R and DVD+RW discs.